We did this hike on the spur of the moment. The weather was supposed to be lousy but it dawned without a cloud in the sky. Mary Ellen's book (at least the editions that we have) only talks about hiking to the end of the trail that is actively maintained by the National Forest Service. This is about 1.3 miles in, and an elevation gain of around 580 feet. This is a very easy hike to this point, with views of Lake Dillon and the 10 mile range as a good deal of the hike is in sage brush meadows. The trail to this point does have blazes for winter activities. (This is the beginning of the trail, just a short bit up from the parking lot - the sign on the middle left says "Tenderfoot Trail". You go through the gate on the middle right). (about twenty yards beyond the gate in the previous picture is where the "red" trail comes out). One can follow the red trail up, sometimes with switch backs as a trail to parallel the red trail, sometimes not. 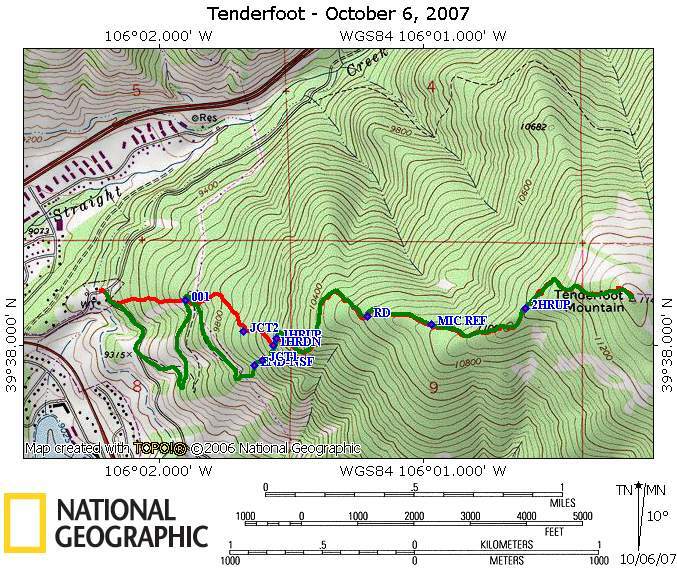 Or as you can see from the map, the green trail (still maintained at this point) crosses the red trail twice around the waypoint 001, at about 0.83 miles in. At that point one could head straight up. At "JCT1", we did see a trail coming in from our left, which we now think was headed for the red trail probably near "JCT2". Regardless, the trail we struck at "JCT1" was the correct trail. You can see that when it finally joined the red trail at the "1HRUP" (one hour up) and the "1HRDN", it was doing a switch back around the red. Continuing up the trail, when it starts to curve to the left, it again gets very steep, and you walk along a ridge. The trail shallows out after a couple of hundred yards and crossing the 10400 foot elevation contour. Further up, the trail then joins a road coming in from the Dillon Cemetery area. Mark where you join the road well as you don't want to miss this coming back down or you will be miles from your car when you get back to the paved roads. I marked it by the fact that in this portion, the dirt road had large pits dug into it, and had a trail parallel to it on the Lake Dillon side. You join the road at approximately 2 miles into the hike up. The following pictures are looking as if you were descending. The green line is the correct way to go if you don't want to end up miles from your car. At 2.2 miles, a large rectangular green structure appears on your right. Carl Oppedahl has postulated that this is a micro-wave mirror to reflect microwave signals and change their direction. If you go to Google Earth or Google Maps, you can see in fact that they have cleared trees along to paths into this mirror. The road splits at this point, and one trail has a marker put by the NSF stating no motorized vehicles. After this marker just follow the path up to the summit where it is flat and a meadow but not really above tree-line. Marina on a natural cairn which we called the summit. Ptarmigan is seen in the distance. Stitched pictures going from the Gore range on the left through Ptarmigan, over towards Lovand Pass. Our house. 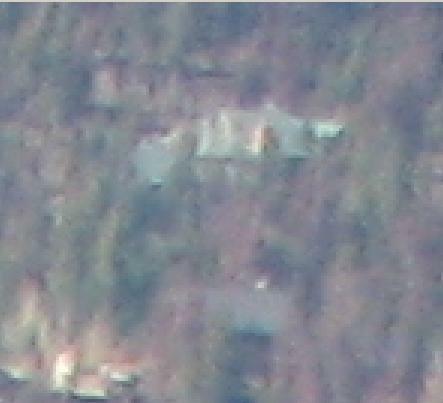 I zoomed in about where I thought the house was located, then here the picture is blown up and pixelized. No magic CSI software to pull out the details. According to the Topos, this is about 5 to 5.1 miles away as the eagle flies.